The first prophet said to the people, “In the time of the First Fire, the Anishinabe nation will rise up and follow the sacred shell of the Midewiwin Lodge. The Midewiwin Lodge will serve as a rallying point for the people and its traditional ways will be the source of much strength. The Sacred Megis will lead the way to the chosen ground of the Anishinabe. You are to look for a turtle shaped island that is linked to the purification of the earth. You will find such an island at the beginning and at the end of your journey. There will be seven stopping places along the way. You will know the chosen ground has been reached when you come to a land where food grows on water. If you do not move you will be destroyed.” The second prophet told the people, “You will know the Second Fire because at this time the nation will be camped by a large body of water. In this time the direction of the Sacred Shell will be lost. The Midewiwin will diminish in strength, a boy will be born to point the way back to the traditional ways. He will show the direction to the stepping stones to the future of the Anishinabe people. The other prophet said,” Beware if the Light Skinned race comes wearing the face of death. You must be careful because the face of brotherhood and the face of death look very much alike. If they come carrying a weapon…beware. If they come in suffering… They could fool you. Their hearts may be filled with greed for the riches of this land. If they are indeed your brothers, let them prove it. Do not accept them in total trust. You shall know that the face they wear is one of death if the rivers run with poison and the fish become unfit to eat. You shall know them by these many things. At the time of these predictions, many people scoffed at the prophets. They then had medicines to keep away sickness. They were then healthy and happy as a people. These were the people who chose to stay behind in the great migration of the Anishinabe. These people were the first to have contact with the Light Skinned race. They would suffer the most. When the Fifth Fire came to pass, a great struggle did indeed grip the lives of all Native people. The Light Skinned race launched a military attack on the Indian people through-out the country aimed at taking away their land and their independence as a free and sovereign people. It is now felt that the false promise that came at the end of the Fifth Fire was the materials and riches embodied in the way of life of the light skinned race. Those who abandoned the ancient ways and accepted this new promise were a big factor in causing the near destruction of the Native people of this land. When the Sixth Fire came to be, the words of the prophet rang true as the children were taken away from the teachings of the ELDERS. The boarding school era of “civilizing” Indian Children had begun. The Indian language and religion were taken from the children. The people started dying at an early age… they had lost their will to live and their purpose in living. In the confusing times of the Sixth Fire, it is said that a group of visionaries came among the Anishinabe. They gathered all the priests of the Midewiwin Lodge. They told the priests that the Midewiwin Way was in danger of being destroyed. They gathered all the sacred bundles. They gathered all the scrolls that recorded the ceremonies. All these things were placed in a hollowed out log from the ironwood tree. Men were lowered over a cliff by long ropes. They dug a hole in the cliff and buried the log where no one could find it. Thus the teachings of the ELDERS were hidden out of sight but not out of memory. It was said that when the time came that the Indian people could practice their religion without fear that a little boy would dream where the Ironwood log, full of the Sacred Bundles and Scrolls were buried. He would lead his people to the place. The Seventh Prophet that came to the people long ago was said to be different from the other prophets. He was young and had a strange light in his eyes. He said, ” In the time of the Seventh Fire, New People will emerge. They will retrace their steps to find what was left by the trail. Their steps will take them to the ELDERS who they will ask to guide them on their journey. But many of the ELDERS will have fallen asleep. They will awaken to this new time with nothing to offer. Some of the ELDERS will be silent out of fear. Some of the ELDERS will be silent because no one will ask anything of them. The New People will have to be careful in how they approach the ELDERS. The task of the New People will not be easy. It is at this time that the Light Skinned race will be given a choice between two roads. If they choose the right road, then the Seventh Fire will light the Eighth and final Fire, an eternal Fire of peace, love, brotherhood and sisterhood. If the light skinned race makes the wrong choice of roads, the destruction which they brought with them in coming to this country will come back at them and cause much suffering and death to all the Earth’s people. Traditional Mide people from other Nations have interpreted the two roads that face the Light Skinned race as the road to technology and the other to spiritualism. They feel that the road to technology represents a continuation of Head-Long rush to technological development. This is the road that has lead to modern society, to a damaged and seared Earth. Could it be that the road to technology represents a rush to destruction? 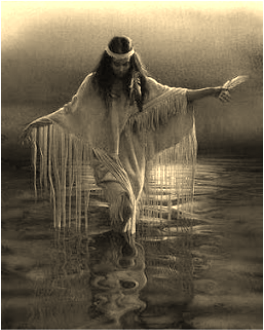 The road to Spirituality represents the slower path that traditional Native People have traveled and are now seeking again. The Earth is not scorched on this trail. The grass is still growing there. The prophet of the Fourth Fire spoke of a time when “two Nations will join to make a Mighty Nation”. He was speaking of the coming of the Light Skinned race and the face of brotherhood that the Light Skinned Brother could be wearing. It is obvious from the history of this country that this was not the face worn by the Light Skinned race as a whole. That the Mighty Nation spoken of in the Fourth Fire has never been formed. If the Natural People of the Earth could just wear the face of brotherhood, we might be able to deliver our society from the road to destruction. Could we make the two roads that today represents two clashing world views come together to form a mighty Nation? Could a Nation be formed that is guided by respect for all living things? Are we the New People of the Seventh Fire?